Fruity Quark filled "Choco Cookie Basket"
Chocolate Cookies have always been favorites to kids & adults. For this recipe chocolate cookies is made in a form of bowl with a cover and filled with seasonal fruit and quark cheese. This recipe has come out exceptionally well from what I had thought before started making. Filling can be of anything depending on your kid's choice of fruit and cream. Seasonal fruits help them get all the essential nutrients and cream/ cheese provide with the calcium, these are vital for their proper physical and mental development. 1) Keep mealtime as casual fun time. 2) Be a good role model, you yourself should eat all fruits and vegetables. 3) Involve your child while shopping for vegetable and fruits and sometime in preparing of food as well. 4) Offer some healthy choices when appropriate. 6) Hide some healthy stuff by cutting the vegetables really tiny. 7) Most important praise them for eating everything you served. Job-well-done. Hope you enjoy making this recipe for your little one and the above rules help you to keep feeding them without much stress. The recipe can also be used as a light dessert during your lunch / dinner get together. 1) Sieve flour, coco, salt, baking powder twice and set aside. 2) Whisk egg, butter, vanilla essence together. Add sugar. 3) Mix all the dry ingredients to make tight dough. Use additional flour if required. 4) Preheat the oven at 180 degree Celsius. 5) Butter muffin tin upside down as referred in pictures. 6) Roll the dough in a rope and cut it in 12 equal parts. 7) Take one part and press with hand to make a flat disc. Put it on the muffin back and repeat it for rest of 11 dough parts. 9) Bake it for 20-25 minutes at 180 degree Celsius until brown and hard. 10) Meanwhile for the filling, mix all the ingredients in a bowl. 11) Once the cookies are baked let it cool for 5 minutes until its easy to handle the muffin tin. Slightly knock the cookies from the tin using a spoon or butter knife. It comes out easily. 12) Fill it with the fruit and cheese mixture and cover it with the cookie lid. 13) Fruity Quark filled "Choco Cookie Basket" is ready to serve. Feeding a picky eater can be real nightmare for the mothers. Some kids just don't like the look and feel of the food. It may be the smell or the texture of food bothering them. Lastly it could simply be a power struggle because they really don't want anybody telling what and when to eat. Whatever be the reason mothers are always at the receiving end. And to help all those I am here with few eye pleasing, healthy, quick and minimum ingredients recipes. We will talk about all do's and don'ts of feeding a picky eater all this week. My son is already enjoying these fancy quick meals. These are real simple recipes hence I am sharing both vegetarian and non- vegetarian options for all kind of food habits. 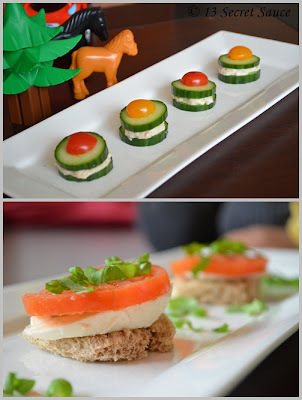 1) Tuna bites, this is basically a 3 ingredient quick sandwich to suffice your kids hunger and even fathers can make it. 2) Insalata Caprese Sandwich is inspired by a famous and simple Italian salad called Insalata de Caprese. It's again a 4 basic ingredient quick recipe. Both these recipes can also be used as an antipasto/ starter for a full meal menu. 1) Mix the shredded tuna fillet and mayonnaise in a small bowl. 3) Cover with rest of the slices and press gently. 4) Garish it with cut cherry tomato and serve cold. 1) Roll the bread using a rolling pin to flatten it a bit. Cut a circle or the desired shape using a cookie cutter. Make 6 such shapes. 2) Place the sliced mozzarella over it. 3) Spread some pesto sauce over the mozzarella, drizzle it with olive oil, salt and pepper. 4) Top it up with tomato. 5) Garnish it with fresh basil leaves. Monkey bread, also called monkey puzzle bread, sticky bread, African coffee cake, golden crown, pinch-me cake, bubble loaf or monkey brains. It is a sweet, sticky, gooey pastry served in the United States for breakfast. It consists of pieces of soft bread with cinnamon sprinkled on it. Recipes for the bread first appeared in American women's magazines and community cookbooks in the 1950s, and the dish is still virtually unknown outside the United States. The bread is made with pieces of sweet yeast dough (often frozen) which are baked in a cake pan at high heat after first being individually covered in melted butter, cinnamon, sugar and chopped pecans. It is traditionally served hot so that the baked segments can be easily torn away with the fingers and eaten by hand. I was so enthusiastic when I first found this bread, always wanted to make it from the scratch. it generally uses frozen dough but I am making a buttermilk bread dough and filling it with soft cream cheese to give this authentic recipe an interesting twist. 1) Mix salt, flour and active yeast in a large bowl. Warm the milk and add lemon juice, honey and olive oil to it. 4) Mix cinnamon and sugar together in a small bowl. Melt butter in another bowl. 5) Once the dough is ready after rise, put it on a floured surface. Punch dough down; divide into 6 equal portions. 6) Working with one portion at a time (cover remaining dough to prevent drying), roll into a 6-inch rope. Cut each dough rope into 6 equal pieces, shaping each piece into a 2-inch ball. 7) Roll the ball flat in 3 inches round circle. Brush it with butter and spread 1/2 teaspoon of the cinnamon sugar mixture over it. 8) Put 1 teaspoon of cream cheese in the center of the round and close the flat rolled dough to make a ball. 9) Dip each ball again in butter turning to coat, and roll in sugar mixture. 10) Coat a 12-cup Bundt pan with cooking spray. Spread the chopped walnut at the base and layer it up with the stuffed balls. Repeat procedure with remaining 5 dough ropes. Sprinkle any remaining sugar mixture and butter over the dough. 11) Cover and let rise in a warm place for an hour or until almost doubled in size. 12) Preheat oven to 180 degree Celsius. 13) Bake at 180° C for 25 minutes or until golden. Cool 5 minutes on a wire rack. Place a plate upside down on top of bread; invert onto plate. 14) Enjoy this gooey bread hot or cold. Baguettes are long thin loaves of bread popular in France, and other French-speaking countries. Baguettes are common in Europe. Usually, they are made of white bread having a hard crust on the outside but soft white bread on the inside. French traditions say that bread may only contain the following four things: flour, water, yeast and salt. Anything containing more than those things must not be called bread. It is common to dip the bread into olive oil when it is eaten. The baguette is thought as to have come from France, but it actually came from Vienna. In the middle of the nineteenth century, steam ovens had just been brought into use. This allowed loaves to be made with a crispy crust and the white center similar to today's baguettes. Outside France, the baguette is also called a 'French stick'. It is a loaf of bread, up to a meter long but only about four to five centimeters in diameter. The baguette is a symbol of France. Baguettes are eaten as a sandwich cut in half. They are also eaten for breakfast (usually with jam or chocolate spread). I am making a dragon tail baguette which is an extension to the original french bread. Simple styling gives a different and fascinating look to your bread basket. 1) Mix the water and yeast using a whisk. 2) Pour it in the bottom of a large bowl and add all the flour. 3) Using you hand, bring all the dough together and set it aside for 10 minutes. 4) Bring out the dough on a floured surface and stretch using your palm. Fold it to half and turn around 90 degrees. Repeat the process for 5- 6 times until the dough is elastic but not sticky. 5) Put it in a clean bowl, cover it up with a cling film and let it rise at a warm place for about 1 hour of it doubles in size. 6) After an hour take the dough out and punch it down a little. Divide it in 4 equal parts. 7) Take one part and stretch the dough to make a small rectangle. Fold the upper 1/3 to the middle. Fold the rest to the end of rectangle and close the ends using your finger. 8) Repeat the process for rest of the 3 pieces. Cover it and let it rest for 10 minutes. 9) Elongate the dough to get the desired length. Flatten it up from the seam side and repeat step 7. 10) Let it stand for another 45 minutes to rise. 12) Meanwhile, preheat the oven to 260ºC. You will also need steam during the initial phase of baking. Cover the baguette with the aluminium foil and bake for 10 minutes. Remove the foil, steam will be created inside the tray which will help in getting a nice crust outside. This time of the the year is for celebration of Love.. Its "Saint Valentine's day"
Wanted to make something special which can signify the day, and as I am baking bread all this week, it has to be bread. Today's recipe is heart shaped bread with tiger/ giraffe like print on them. Tiger bread is the commercial name for a loaf of bread which has a unique mottled crust. It is also sold as Dutch crunch in the USA, tijgerbrood or tijgerbol in Netherlands. The bread is generally made with sesame oil and with a pattern baked into the top made by painting rice paste onto the surface prior to baking. The paste dries and cracks during the baking process. The rice paste crust gives the bread a distinctive flavour. It has a crusty exterior, but is soft inside. Typically, tiger bread is made as a white bread bloomer loaf or bread roll, but the technique can be applied to any shape of bread. I am making a basic white bread but any of the breads can be made with these dutch icing to get the tiger pattern. 1) Put all the ingredients in a bread machine or in a large bowl if you want to do it by hand. 2) Bring it all together to make soft but not sticky dough. 3) Transfer the dough into a clean bowl and coat it with oil. Put it in a warm place and let it rise for an hour until it doubles in size. 4) After an hour, punch the dough down using you hand. Cut it into 8 even pieces or depending upon the size of the bread you require. 5) Shape them in form of heart using your hand. Make a round of the dough and the press it from the top side to give it a shape of heart. Place it on the baking sheet. 6) For tiger paste whisk all ingredients together in a small bowl. Cover and leave to rise for 10 minutes. 7) After the bread hearts have been rising for 10 minutes, stir the paste vigorously and then brush lightly over the rolls you use your finger or back of spoon to do so, it gives a better result. 8) The paste will have the consistency of thick, pouring cream. Thicker the layer of paste, larger will be the pattern on the finished bread. 9) Pre-heat the oven to 190 degree Celsius and then bake for 25-30 minutes. Turn the baking sheets around after 15 minutes, to get an even coloring. 10) Leave to cool on wire racks. "Challah" is a special Jewish braided bread eaten on Sabbath and holidays. It is also named khale, berches, barkis, bergis etc. According to Jewish tradition, the three Sabbath meals (Friday night, Saturday lunch, and Saturday late afternoon) and two holiday meals (one at night and lunch the following day) each begin with two complete loaves of bread. Each single loaf is woven with six strands. Together, both loaves have twelve which represent each tribe of Israel. Traditional Challah recipes use numerous eggs, fine white flour, water, yeast, and sugar. Modern recipes may use fewer eggs (there is also an egg less versions) and may replace white flour with whole wheat, or oat. Sometimes honey or molasses is substituted as a sweetener. The dough is rolled into rope-shaped pieces which are braided and brushed with an egg wash before baking to add a golden sheen. Sometimes raisins are added. Some bakers like to sprinkle sesame or poppy seeds on top for flavor. 1) Add 1/4 cup on flour, warm water, 1 tsp sugar and yeast in a large bowl. Let it stand for 15 minutes until yeast become active. 2) Whisk together sugar, 3 eggs, salt and oil to the bowl. 3) Add in the remaining flour, one cup at a time kneading it in. Knead for about 5 minutes until smooth. You can add more flour if the dough is sticky. 4) Cover the dough with a cling film and let it rise at a warm place for about 1 and half hour. 5) Punch the dough down and transfer it to a lightly floured surface. 6) Knead for about 5 minutes. You can add raisin and walnut here to the dough. It definitely adds flavours to the bread. 7) Divide it into six equal part and roll to make long strands approximately 9 inch long. You can make three or four strand bread as well. 9) Put the braided bread on the baking tray and cover it with a kitchen towel. Let it rise again for about 45 minutes to an hour in a warm place. 11) Beat the remaining egg and brush it over the bread. Sprinkle some sesame seeds over the bread. 12) Bake the bread till golden brown about 30-35 minutes. Cover the top with a sliver foil if its browning too fast. 13) You can enjoy this little sweet bread in you morning breakfast as a French toast with some honey. Nothing can be more fun to make Rose Bread on Rose day... what a coincidence!!! I was planning to bake breads from long, so all this week and coming week I am blogging and posting about few of the interesting hand crafted Artisan bread. Someone well said- "All sorrows are less with bread"- I am so happy and excited baking bread all this week. About today's recipe, I am not sure about its origin but first saw it on a blogger group and bookmarked it. This is filled, rolled and braided bread. You can also call it Russian Braid, Caucasian Bread or I would love calling it turban bread. Whatever you name it, this bread is as tasty to eat as it looks. I used the cinnamon butter filling, but there are so many variations using other ingredients like pesto, nutella, chocolate or fruit filling. Shaping the bread is most technical part of this recipe; I am trying to show step by step photo instruction to make it easy for you. Hope you enjoy making it as much as I did. 1) Grease the bottom and side of 10" spring form pan. You can use any round cake pan but spring form helps better in the bread formation. 2) Add flour, egg, yeast, sugar, salt and 1/4 cup oil in a bowl and mix until well. 3) Add vinegar to warm water, stir, then add to the other ingredients. 4) We can use a food processor to make a elastic dough which is not sticky. I am using hand to do so, mix all ingredient above and bring it together. 5) Put it on a floured surface and stretch the dough fold it to half and turn 90 degrees. Repeat the process to make it into a elastic but not sticky dough. Use your hand in circular motion to make it round. 6) Place 1 Tbs oil in a bowl, place the dough in the bowl and ensure it is well coated with oil. Cover it with a cling film and let it rise for 1 hour in a warm place. 7) It will nearly double in an hour. 8) On a lightly floured surface, carefully roll dough into a large rectangle, about 12" x 24"
9) Brush the butter over the entire dough. 10) For Filling combine the sugar and cinnamon in a small bowl. 11) Sprinkle all the sugar evenly over the buttered surface. 13) Close the end tight. and cut it lengthwise using a sharp knife. 14) Gently flip the roll to the open side so that layers are facing up. 16) Carefully cross the ropes over each other facing the open side up. Pinch the ends together. 17) Roll the long braid in a circle. Tuck the end of the rope into the wreath. 18) Place it carefully on the bottom of the spring form pan. Cover it with a cling film or kitchen towel to rise for 30 minutes. 19) Meanwhile preheat the oven at 200 degree Celsius. 20) Bake it at 200 degree for 10 minutes and the reduce the temperature to 190 degree celcius and bake for another 30 minutes. 21) Remove the bread to a wire rack and let it cool for before serving. 22) Enjoy this yummy looking bread with your friends and family.